Bored with the same old salad? You'll love this citrusy recipe--it's rich in healthy fats from avocado and contains oranges, one of the best superfoods for weight loss. 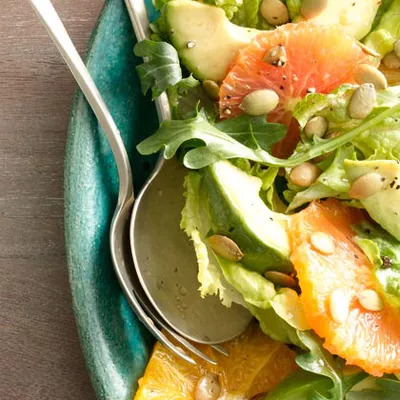 Only 180 calories per serving, this salad is a great source of vitamin C thanks to the limes and oranges, and is topped with toasted pumpkin seeds, which are high in zinc and may even help calm irritated skin. Ingredients: oranges, limes, extra-virgin olive oil, salt, pepper, avocados, bibb lettuce, raw pumpkin seeds.